A CPS staging system is one of the finest available on the market and is the perfect solution for religious buildings. Why is that we hear you ask. Well, to start with they are extremely versatile and comprise of aluminium and strong timber decks. They are also compact to store, easy to assemble and take down (if required) and the individual units can be manufactured to virtually any shape, size or finish to create a stage which can be tailored to your exact requirements. 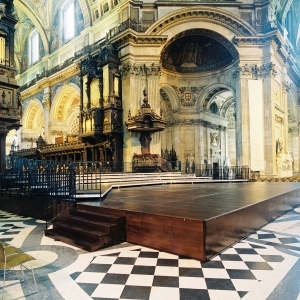 A CPS stage can truly complement the surroundings of any hall, church or cathedral with many options including hardwood surfaces and fascia’s, matching carpets or bespoke furniture such as lecterns and mercy seats, etc. If samples are available of the existing building furniture, CPS can match the staging to blend in perfectly with the original furniture. The staging platforms can be adapted to fit around the most complex of pulpits or pillars, while the quick release detachable leg system allows a flat stage to be built over stepped or uneven areas, or be changed into a choral tier in a matter of minutes. Assembly of the staging is a doddle and once assembled there is no hassle, no rattles from loose tops or clanking components. You’re simply buying a quality product that will last for years and we haven’t even mentioned our lifetime warranty promise. The platforms are free standing and do not interfere with the fabric of the building, making them perfect for listed buildings while their strength and durability makes them very suitable for permanent use if so desired. Whatever your project or problem may be, CPS would welcome the opportunity of being able to provide a solution. You may even be struggling to visualise your new stage but CPS is passionate about being able to take your project from concept to completion and can successfully provide a staging system of any shape, any size and any height. Please note that we are very conscious of tight budgets and have a range of keenly priced staging packages to suit every budget. For more details of our staging products and our lifetime warranty, please contact Tim Gilson on 01302 741888 or email us and we’ll be in touch as soon as we possibly can.